The projects on this page have been completed by students during their time with the Advanced Steel Processing Group. EBSD images showing the deformed austenite grain structure (left) and the recrystallised grain structure (right) in the Fe-30Ni-0.44Nb steel. TEM image showing precipitates in a partially recrystallised sample. The excellent mechanical properties (both strength and toughness) of HSLA steels means they are used extensively in the structural and transport industries and for oil and gas pipelines. This is achieved by generating a fine uniform grain microstructure via the precise control of recrystallization during the rolling process. HSLA steels often contain small quantities of Nb, V and Ti, i.e. strong carbo-nitride formers, which affect the grain size development through grain boundary pinning on reheating and retardation of recrystallization by precipitation pinning and solute drag. Niobium is the most influential element on recrystallisation in HSLA steels. The crystalline defects generated during the rolling process provide the driving force for recrystallization, and can also considerably accelerate precipitation, i.e. strain-induced precipitation (SIP), since the dislocations act as nucleation sites for precipitates. The precipitation nucleation rate, density, size and dispersion properties for SIP differ from that of precipitation in undeformed austenite. The interaction between SIP and the deformation substructures affects the evolution of recrystallisation. Therefore, to precisely control the final mechanical properties of HSLA steels through grain size refinement via recrystallisation, the effect of SIP evolution, preceding or during recrystallisation, on the recrystallisation process needs to be understood.The aim of this project is to investigate the nucleation and growth mechanism of strain induced precipitation during and after deformation and to quantify the interaction between recrystallisation and precipitation. This work used Fe-30Ni alloy, containing Nb, as it retains its austenitic structure to room temperature allowing the deformation structures seen during high temperature rolling to be retained. Examples of deformed and recrystallised grain structures are shown, along with initial observation of strain induced precipitates. Casting of peritectic steels often causes defects such as crack formation, hot tearing and even breakouts, all of which lead to technical and financial disadvantages. The solidification process in peritectic steels was studied to understand how the mechanism of contraction can help reduce defects. In this project, two commercial peritectic steels were considered to assess solidification transformation and contraction behaviour. The equilibrium and non-equilibrium solidification paths of two steel grades have been simulated using ThermoCalc software. Differential Scanning Calorimetry (DSC) was used to determine the peritectic transformation temperatures of the steel grades used in this study. 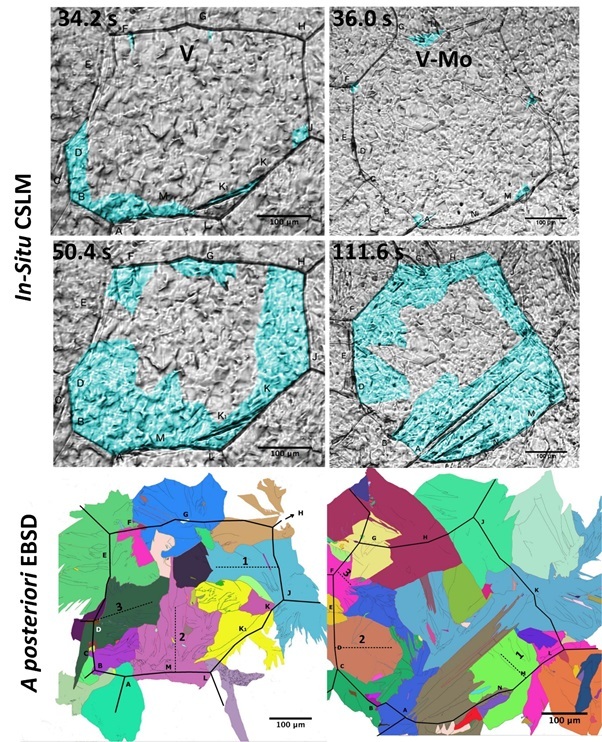 The influence of cooling rate on the phase transformation during solidification of peritectic steels was studied using Confocal Scanning Laser Microscope (CSLM). The contraction behaviour of peritectic steels was conducted using an experimental setup with a laser measurement apparatus developed for the shrinkage measurements. The effect of different cooling rates on the steel contraction during initial solidification was evaluated and quantified. A non-peritectic steel was used for the contraction tests in order to correlate the contraction behaviour of peritectic and non-peritectic steels. This technique elucidated the associated phenomena between crack formation at the steel shell during cooling in the continuous casting process. Grain sizes in a high stength low alloy (HSLA) steel that has been continuously cast as slab (left) and a high Al steel that has been laboratory ingot cast (right). Most strip steels produced today are made using continuous casting techniques, where a continuous slab is produced, typically between 50 and 250mm thick and is sectioned then later reheated and hot rolled down to strip. This is an energy intensive process and energy savings of around 80% are possible though casting directly, or at least close to, the end products required thickness. However, ensuring that the required properties are achieved in the as-cast (minimally deformed) strip is a challenge. Additionally some steel grades, such as those with a large amount of aluminium, show promising properties for strip applications (e.g. low density for automotive use) but are extremely difficult or expensive to produce at an industrial scale with conventional continuous casting techniques; direct casting may offer a way to make these steel grades more commercially viable. Most metal objects are made of many individual crystals called grains and the size of these grains plays an important role in determining the mechanical properties, a reduced grain size improves both strength and ductility. Conventional techniques cast metal with moderately sized grains then as it is rolled the grain size is refined by recrystallisation. Another way to reduce grain size is to solidify the material faster; direct casting to strip gives cooling rates several orders of magnitude higher than in continuous casting, leading to smaller grain sizes. While this processing route offers a lot of potential in terms of energy saving and producing new steel grades, direct strip casting is very technically challenging, hence its current underdeveloped state. One issue is that the combination of high surface area to volume ratio and increased atmospheric exposure of both the liquid and just solidified steel make atmospheric interactions far more serious so an inert atmosphere must be maintained. Another is the level of control and consistency necessary to produce an acceptable quality product, even very small inconsistencies in the strip can lead to major quality issues. The drastically reduced thickness also means that a much greater length of material must be produced in a given time in order to compete with the volume of output from a conventional continuous casting facility. In this work the effect of high solidification rates on the microstructure development (grain size and segregation) in high strength low alloy (HSLA) and high Al steel grades were considered. This work looked to develop a new hybrid superplastic forming process in combination with a high strength aluminium alloy. A combination of physical testing, elevated temperature tensile testing, cone gas bulge and custom designed tool gas bulge tests were used to assess material formabilities to define the optimum forming conditions and establish an industrially suitable forming process. Testing established the suitability of a forming cycle within the industrial five minute target time, with the alloys undergoing recrystallization during preheat stages, forming at higher than typical strain rates and achieving full solutionization during the forming cycle. A two stage aging treatment (90°C for 8 hours and 130°C for 18 hours) achieved a high strength T5 temper meeting the industrial target of 300 MPa. AA7020 alloy was capable of achieving strains in excess of 400% in the 5minute forming cycle under optimal forming conditions provided the alloy had experienced a minimum 100% strain before contact with male tooling. After aging treatment the alloy was seen to achieve a yield strength of 305 MPa, slightly in excess of the industrial target. A 1.6wt% nickel addition to AA7020 labelled alloy V3C initially showed increased performance in terms of formability and strength. The scale up of this alloy in the form V3CN showed decreased performance when compared to the V3C but was capable of strains in the region of 120% in the five minute forming cycle, a significant reduction compared to AA7020 but with no minimum strain requirement before contact with male radii. After aging treatment the alloy achieved a yield strength of 342 MPa, suggesting use as a higher strength alternative to AA7020 in applications with less extreme geometries. Caption:3D reconstructions of the metal phase of emulsification experiments where an iron-phosphorus (0.2 wt%) droplet was held at 1600oC for 20 and 25 seconds respectively. The individual perturbations on the surface are then shown to be segmented and coloured by size, giving a clear indication of the population advancing along the growth cycle through the 5s interim between samples. The steel industry is facing significant competition on a global scale due to the drive for light-weighting and cheaper more sustainable construction. Not aided by oversupply in geographic sectors of the industry, there is significant competition within the slowly shrinking sector. The recent growth in developing countries through installation of modern plant technology has led to the reduction in unique selling points for mature steelmaking locations. As such, to compete with the equalling product capability and innate cheaper production costs within developing areas the industries in Europe and North America require significant improvements in productivity and agile resource management. To date the basic oxygen furnace has been somewhat treated as a black box within industry, where only control parameters are monitored, not the fundamental mechanisms within the converter. Studies over the past 30 years have shown the basic oxygen furnace is unable to attain the thermodynamic minimum phosphorus content within the output liquid steel. Coupled with the need to drive down resource cost, with a potential for high content phosphorus ores the internal dynamic system of the basic oxygen furnace requires more rigorous understanding.With the aid of in-situ sampling of a pilot scale basic oxygen furnace, and laboratory studies of individual metal droplets suspended in a slag medium (known to be a key driving environment for impurity removal) the present project aims to provide insight into the transient interfacial area between slag and liquid metal through basic oxygen steelmaking processing. Initially the macroscopic dynamics including the amount of metal suspended in the gas/slag/metal emulsion, the period of time it is suspended for, and the speed at which it moves, is investigated. It was found that these parameters vary greatly through the blow, with a normal peak in residence times near the beginning of the blow and a dramatic increase in metal circulation rates at the end of the blow, when foaming is reduced or collapsed. Further to this, a method of interrogating the size of metal droplets within the slag layer using X-ray computed tomography is introduced.The study then progresses into the microscopic environments that individual droplets are subjected to during steel processing. Initially the cause of spontaneous emulsification in basic oxygen furnace type slags is investigated through high temperature-confocal scanning laser microscopy/X-ray computed tomography led experimentation, with the addition of null experiments conducted to rationalize the experimental technique. It was found that the flux of oxygen across the interface was the cause and thus the confirmation of material transfer across the interface being the driving force. Furthermore the physical pathway of emulsification is interrogated and quantified, with in-situ observation of spontaneous emulsification in the high temperature-confocal scanning laser microscope enabled through use of optically transparent slags. The life cycle of perturbation growth, necking and budding is observed and quantified through high-resolution X-ray computed tomography. In addition a phase-field model is developed to interrogate slag/metal systems in 2D and 3D variations, giving rise to the ability to track the cause of emulsification and to predict its occurrence. Finally the project progresses with the in-situ investigation of spontaneous emulsification as a function of initial metal composition. The behaviour of droplet spontaneous emulsification is seen to reduce in severity and subsequently to decline into a non-emulsifying regime below a critical level. Free energy calculations coupled with a measure of the global interfacial tension increase give quantifiable reasoning as to the behaviour seen. metal required for the electrodeposition into the chloride layer sustaining the process. 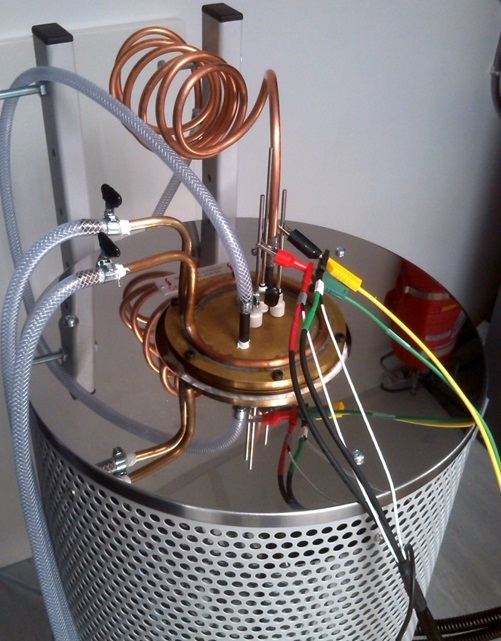 providing a feasible, alternative valuable metals recovery method design. Because of demand for lower emissions and better crashworthiness, the use of boron Steel has greatly increased in manufacturing of automobile components. For many applications in the automotive industry it is required that only certain regions in a hot stamped part are fully hardened whereas other regions are required to have softer microstructure. For example in an automobile structural component like B-pillar, which may undergo impact loading, it is desirable that there are certain regions in it which are softer and more ductile so that the component's overall energy absorption is improved. The innovative process of tailored hot stamping allows this by controlling the local cooling rates. Now for optimal use of this technique a microstructural model is required, which can make reliable predictions about the phase distribution in the final microstructures in different regions of hot stamped parts. Most of the existing available microstructural models for hot stamping process only take into account the thermal history of the region while not taking into account the effect of mechanical deformation on the final microstructure. There is considerable amount of work available in literature, which indicates that the mechanical deformation has a significant effect on the final phase distribution in the microstructure of hot stamped parts. In this project an Artificial Neural Network (ANN) based microstructural model is being developed, which would take into account both the thermal history and effect of mechanical deformation while making prediction about the phase distribution in the final microstructure of tailored hot stamped parts. Such a model will allow us to make the final phase distribution predictions in tailored hot stamped parts with greater reliability and will allow us to better understand the relationship between the various processing parameters and the final microstructure. Ever stringent environmental regulations urge automotive industry to strive for light-weight solutions in automotive body-in-white and chassis applications without compromising passenger safety or manufacturing robustness. The steel industry has responded to this challenge by developing Advanced High Strength Steels (AHSS), both in their hot-rolled as well as cold-rolled and annealed product offerings, for down-gauging potential. However, these steels frequently rely on multi-phase microstructures, which are excellent for strength and stretchability, but may sometimes lead to insufficient stretch-flange formability. To respond to the relatively low stretch-flange formability of conventional AHSS grades and to offer attractive alternatives for roll-forming applications in the strength region typically dominated by AHSS, expansion of the present cold-rolled and annealed HSLA product offering is considered. HSLA steels with a single-phase ferritic microstructure and typically high yield ratio offer an attractive and promising solution. This project proposal is related to efforts within Tata Steel R&D to pursue new product concepts in the area of a new range of cold-rolled and annealed HSLA with increased tensile strength (TS > 550 MPa). These new grades will rely more than conventional HSLA steels on precipitation hardening and will require alternative exploitation of precipitation hardening than conventional HSLA. Whereas with conventional HSLA most of the precipitation hardening is achieved in the hot-rolling process, the aim is here to partially or fully suppress precipitation hardening during coiling in the hot-strip mill and to promote precipitation during continuous annealing. Fig. 1 Schematic diagram of a single RCF crack (the crack shape is approximately semi-elliptical when the cracks are light to moderate, i.e. surface lengths of less than 19mm based on the Railtrack (now Network Rail, UK) RCF crack visual length/depth guidance diagram). Fig. 2 Contour plots of (a) Bx and (b) Bz distribution when a single RCF type crack is present and the associated signals along the measurement line. Rolling contact fatigue (RCF) cracks are a widespread problem that impairs the service life of railway rails and wheels, with an associated high cost of labour and capital expenditure for remediation. Severe RCF cracks cause serious safety issues as they can turn down at a larger propagation angle into the rail potentially leading to a rail break. Rail grinding can effectively eliminate RCF cracks if they are detected when they are small enough to be removed. Alternating current field measurement (ACFM) is one of the electromagnetic (EM) techniques that can be used for defect detection and sizing in the rail industry. ACFM has been reported to be more accurate in providing length and depth information than conventional UT for small RCF cracks and is less sensitive to lift-off than eddy current methods. The aim of the present research is to analyse the response of ACFM signals to single and multiple RCF cracks in railway rails using experimental measurements and FE based modelling tools, focusing on the influences of crack vertical angle and multiple cracks (number, spacing, size, uniformity) on the ACFM signal to improve the accuracy of dimension predictions. A novel method (using the Bz signal) is proposed to determine the vertical angle of the RCF cracks, which then allows the crack vertical depth to be determined from the pocket length (standard output from ACFM measurements) and therefore the appropriate amount of rail grinding to remove the RCF cracks. It was found that the vertical angle influences the pocket length determined from the measured ΔBxmax/Bx value when the cracks are shallow (vertical angles < 30°), therefore greater accuracy can be obtained when compensating the ΔBxmax/Bx value using the determined vertical angle. 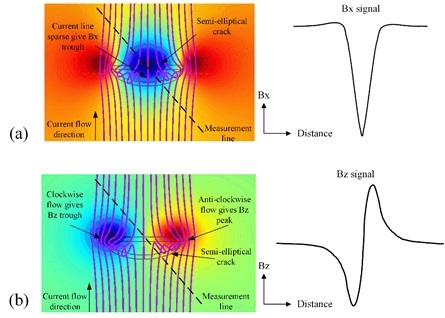 It is shown that the variations of crack surface length, crack inner spacing and crack number for multiple cracks also influence the ΔBxmax/Bx values determined for multiple cracks. The influences of asymmetrical crack shapes on crack sizing are discussed, in general it has been found that for accurate sizing of RCF cracks using a single ACFM scan the cracks should be regular, where the assumption of semi ellipse shapes is appropriate. The methods developed in the project were assessed using calibration samples (machined cracks with different sizes and vertical angles) and rails removed from service containing single and multiple RCF cracks. It was found that the new approach proposed in this work allowed the vertical angle to be predicted well for single and multiple RCF cracks (difference to measurements < 14.3 %). In addition the error in pocket length prediction is greatly decreased when using the sizing method including compensation determined from the crack vertical angle.